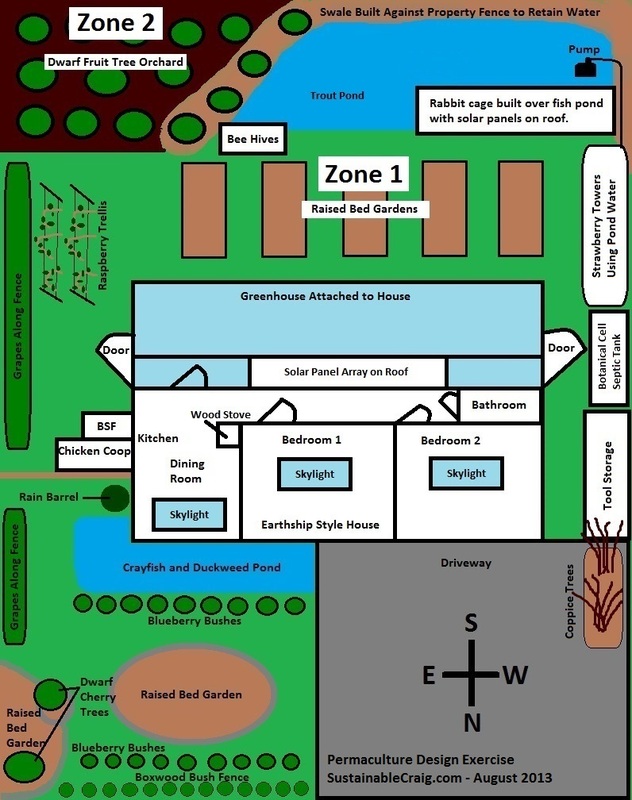 I recently submitted my permaculture design exercise while attending Geoff Lawton’s Online Permaculture Design Course. I thought I’d share my design here on my site. I’m always looking for more ideas and modifications so feel free to chip in with your thoughts. I have chosen my urban homestead in Washington, USA. I live in a large residential neighborhood with one of many cookie-cutter houses. While this site is limited in space it represents the average type of home for my area. If I really want to be a successful permaculture designer in my community it will need to be utilizing urban strategies. This is an aerial shot of my home and the 2 adjacent homes. The totally property is 5,923 sq. ft. or 0.14 acres with a 2,156 sq. ft. 2 story house on the property. The property spans 64ft wide by 95ft in length. There is currently a traditional stick frame home on the property however my design requires a more self-sustaining design. The home in my design plan uses the Earthship design created by Michael Reynolds. It utilizes used automobile tires for the walls which can be found in abundance at a local tire center less than 5 miles from my house. The dirt required to fill the tires to give them the thermal mass properties would be retrieved from the excavation for the foundation and ponds on the property. Total cost of the project should be comparable to the average home cost in my neighborhood ($200,000) however an Earthship would not require a monthly energy bill, water bill, or sewage connection. All water for home use is retrieved through a slant roof that runs through a series of filter at the rear of the houses. The grey water from kitchen sinks will flow to the toilet. Blackwater from the toilets will then flow to a septic tank where it will be broken down by bacteria and then biologically filtered back into the landscape through an exterior botanical cell. The layout of this home design would also allow for a composting toilet to be implemented. The Earthship is facing South so that the greenhouse window is oriented towards the sun. Solar energy passes through the window and heats the house. The energy from the sun is stored in the thermal mass of the building design. A solar panel array is mounted on the roof facing the southern sun to collect energy for household use. Sunlights are also installed on the roof to all for lighting during the day with minimal use of electricity. The greenhouse will be home to an aquaponics garden that will grow tilapia, lettuce, strawberries, kale, and sugar peas. With the system being located indoors it shouldn’t require too much energy to keep the tank water at the optimum temperature for the fish. The wood stove will utilize the coppice wood that is grown on the property in the event that the house cannot maintain a warm enough temperature in the winter. One of the main problems with growing food in Washington is the excess amounts of rainfall, however this can be turned into an asset by pooling up the water into ponds. Geoff stated that aquaculture is one of the most efficient means of growing food. The pond in the front yard will grow duckweed as a food source for the fish. The overflow from the pond in the front yard will passively flow into the raised bed garden. A swale was created along the property fence at the back of the yard. A 3ft high brick wall will be used as a buffer between the property fence and swale dirt so that the wooden planks won’t rot. This swale will channel rainwater to pond in the southwest corner of the property, preventing it from flowing down the slope of my property into the neighbor’s yard. The pond in the backyard will be home to a native species of trout that can withstand the colder water temperatures. Majority of this portion of the yard is shaded by trees on the neighbor’s property. While that makes this location poor for growing crops it is perfect for keeping the rabbit cages and pond water from overheating. The rabbit cages will be located above the pond so that their droppings will fall directly into the water. Ideally this will help supplement the fish food, along with black soldier fly larvae, and a LED light trap mounted just above the surface of the water to attract bugs at night. The rabbits will be raised as a method of converting vegetables and weeds to useable fertilizer as well as for meat production. The top of their cages will be covered in solar panels to further shade them from the sun, keep out rain water, and to power the pump in the pond. Water will be pumped into a set of strawberry towers and then will be gravity fed back into the pond. This will help cleanse the water and ensure that the ammonia is put to good use. If the strawberry towers cannot handle the levels of ammonia reeds will be planted along the edge of the pond. The black soldier fly larvae harvester and chicken coop share a wall with the kitchen. This will allow scraps to be dumped directly down a chute from the kitchen as they are created. This added convenience should allow more people to get on board with recycling their food scraps. Chickens are utilized for their manure and meat however they are primarily used for egg production. Raised beds have been planted through the center of the backyard. This area receives the largest quantities of sunlight. The East and West sides of the yard near the fence also receive lots of sun. To fully utilize the vertical space grapes are planted along the fences and raspberries are planted along trellises. This area will be planted with legumes, broccoli, kale, strawberries, tomatoes, lettuce, sugar peas, corn, cucumbers, and herbs. These are the main crops eaten by my household and grow well in the area. A small orchard of dwarf fruit trees is planted in the southeast corner of the property. Apples, cherries, and figs will be grown in this area. Bees have been placed near the orchard for pollination. They are located near the pond so that they have a water source. The bees will also be used for honey production. Due to the small urban nature of this property zones 3-5 have not been included in my design plan. As shown by the aerial photo of my neighborhood the house here are tightly crammed together for quite a large area leaving no space for these zones at this time. By redesigning my property from the ground up and incorporating a more sustainable building design I could be much more self-reliant. Some of the designs referred to in this plan are already being implemented. This exercise helped me define the next steps to take. It also helped identify some refinements I can make to improve the efficiency of my urban homestead. I’ve really enjoyed this course and am looking forward to continuing my education. What is the anticipated water usage of your whole plan? I have found that although I have enough raised beds to augment much of my summer food consumption, my rain catchment system has not nearly been enough water to keep all teh bed watered. Therefore, I have had to continue to rely on city water supplies, which greatly increase the cost of raising produce. With 3 water systems, several hundred square feet of raised beds, and home grey and black water use, how do you plan on gathering enough water to keep you system going? Great question David! The short answer is I don’t have an anticipated water usage estimate at this time. If I were going through with this plan I’d daisy chain rain barrels along the side of my house to collect as much as I could and then have the overflow run into the fish pond. Then I’d add a drip system to cut down on my actual usage and evaporation during the summer. If I ran low on water for the plants I’d consider harvesting the fish in the pond and pumping the water through the drip system. I currently supplement my gardens with city water as well. One major issue I’ve had with my rain barrels is that tar residue is ending up in the water. Originally I tried to source all of the water for my fish tanks and aquaponics with rain collected from my roof but found this oily residue floating on the top of all of my systems so I had to flush everything and start from scratch with city water. It isn’t feasible for me to switch to an aluminum roof at this time because I don’t want to spend the money when I plan on moving in a year or so. That being said I didn’t amp up my water collection as originally planned. I do intend on trying to mount a large holding tank (IBC tote) and try to run it through a pelton wheel to harness some electrical energy from the process. This project is a little ways out as I’m still researching the physics behind it and need to see if it is even feasible. Thank you for the thought provoking question. I’m also open to other/better ideas that you might have as well so feel free to throw some of your ideas out there.